Today, we started our FOSS mock rock activities. We observed properties, measured what we needed to measure...then as geologists we dug for "gold". Could it be pyrite or copper or yukon gold potatoes. What a great way to get my second grade planters, who are now our 3rd grade geologists to make connections. We discussed what properties we could use if we found a rock in the earth. How could we safely excavate? Safely, we went out to our dig site to find our "rocks" and then use our geology words to measure the circumference, diameter, and depth as well as use our property words once again. What a golden opportunity to tie the garden into science in a new way again. We even found green rocks and red rocks...potatoes that saw the sun and red potatoes. Golden! Digging for "gold". Learning how to be geologists in and out of the classroom. We will be measuring this "rocks" properties. What is its circumference? What is its diameter? What is its weight and depth? Digging for gold is fun...so is science! 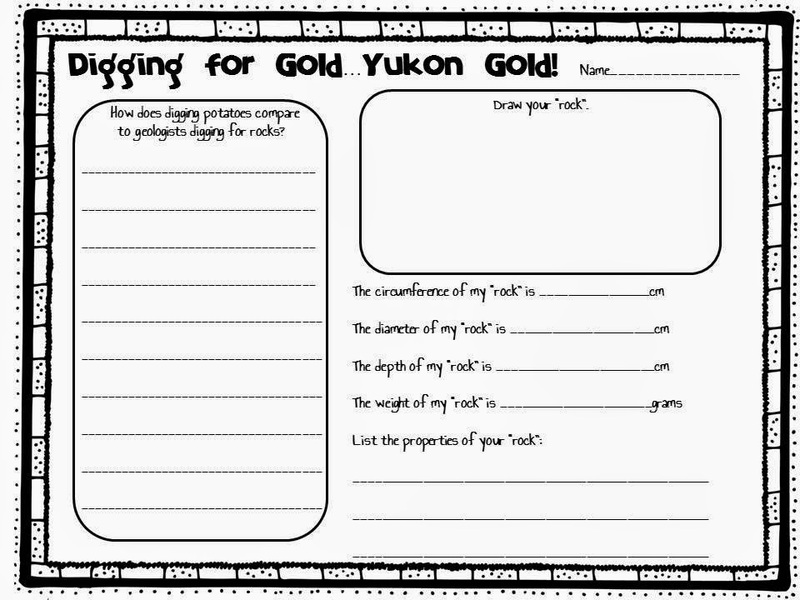 Here is the sheet we will be using next week to record our data and observations. Digging For Gold freebie!